Excerpt from Amazon book blurb: Pick Cantrell, a successful newspaper cartoonist whose career has hit the skids is in the grip of a midlife meltdown, returns with his wife and son to a small North Carolina town. What follows is an extraordinary story as Pick uncovers startling truths about himself and about the role his grandmother played in the tragic General Textile Strike of 1934. 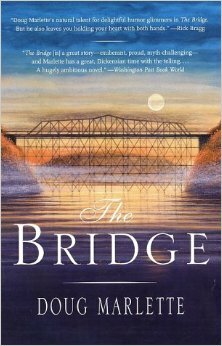 A novel about family, love, and forgiveness, The Bridge explores how much we ever really know about others, and most important, about ourselves. I can hardly put the book down. The writing is exceptional. Having walked the streets of Hillsbourgh, gone on garden tours, eaten at favorite restaurants, Christmas shopped, the setting for the book is dear to me. Eno is the fictional town in the book. Though late to the party that is Marlette’s splendid writing, here I am at last. This entry was posted in About Writing and tagged Author Doug Marlette, Book Reviews, Hillsbourgh NC, Novel-The Bridge. Bookmark the permalink. I should pull The Bridge off the shelf again–read it long ago. Heard him speak at UNC aboutt his cartoons. Very funny and nice person. I finished it last night and my reaction to the novel when I wrote this post certainly held up. I especially appreciated the history lesson he laces into the book. I know you will enjoy it if you reread it in the by and by.